Johnson Kwame Adu Duang was born on August 9, 1953 at Subinkrom near Dormaa-Ahenkro in the Brong-Ahafo Region to Opanyin Kofi Asamoah and Madam Akosua Adomaah, both of blessed memory. He started school at the age of seven (7) in 1960/61 at Subinkrom Local Authority Primary School for five years. In 1965, his uncle, a soldier, took him to Burma Camp in Accra where he continued his primary education from 1966 to 1967. He attended Middle School at Arakan Barracks from 1967 to 1971. After completing Middle School, he got admission into the then Accra Teacher Training College (ATTC), then at Kokomlemle, from 1973 to 1977 and completed with the Teachers; Certificate ‘A’ in July 1977. As a certified teacher, Johnson was first posted to Atebubu Anglican Middle School in October 1977, and he taught there for three years. He was then transferred to Anglican Primary School in Yamfo in the Brong-Ahafo Region in 1980. He taught there from 1980 to 1990. Kwame Adu Duang got converted into The Church of Pentecost on August 8, 1973, through Prophet Appiah Adu, Elder Moses Ofori, and Elder Joe Appiah, who were then members at Burma Camp. He was baptized by immersion on September 24, 1980 during a Regional Convention at Sunyani in the Brong-Ahafo Region. He was ordained an Elder on May 23, 1983, and appointed a Presiding Elder at the Yamfo Central Assembly of The Church of Pentecost two years later (December 31, 1985). Adu Duang got married to Miss Mercy Vida Oddi a native of Adukrom- Akwapim in the Eastern Region. The marriage was blessed by Apostle S. E. Tetteh at Kaneshie No. 2 Assembly on April 4, 1982. The marriage is blessed with five children namely; Pastor Asamoah Adu, Abigail Adomaah Adu, Philip Obeng Adu, Benjamin Kofi Arthur and Sandra Oforiwaa Adu. No good testimony can be given about Pastor Johnson Adu Duang if mention is not made of our dear mother, wife and sister, Mama Vida Adu Duang, who served as a “pillar” behind him. Indeed they formed a formidable partnership in ministry. 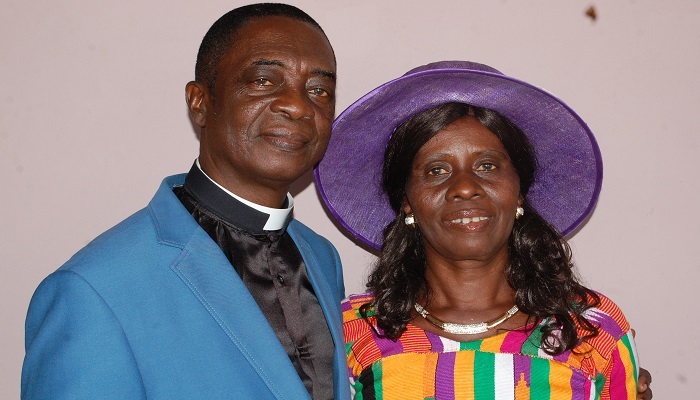 A retirement service would be held in honour of Pastor Johnson and Mrs. Vida Adu Duang on Sunday, July 29, 2018, at the Fumesua Central Assembly in the Bompata Area of The Church of Pentecost.